When you first arrive in Chiang Mai allow yourself a couple of days to acclimatize before setting off up-country on multi day rides. Do a couple of day trips first, while you are acclimatizing. The Samoeng Loop is the very first loop you should do. Check out any of the below to get yourself ready & rolling. Take Your Time: For first timers, the tendency is often to cover as much ground as possible. You end up with general impressions that it is all good, but you want more. Its best to slow down, take your time & explore properly, enjoying the scenery, villages and people. Don’t try and do / see too much in a short space of time. Potter around the loops to take in as much as you can, and learn something about the people, places and culture as you go. If you rush through, it becomes a blur; & you will only want to go back to the same places again because you missed too much. Cornering speeds in the hundreds of kilometres of winding roads are down to 60-80 kph riding “hard & fast.” It takes time, so take your time. Aim to do no more than 250 kms in a day & you will both see & learn something, not just look at the road in front of you. To start in Chiang Mai, click here. From wherever you are in North Thailand you can get back to Chiang Mai in a day, so you can play it as you go. Usually start with this as a short primer. The legendary Mae Hong Son loop is good for 3-4 days the first time, & much more if you want to dawdle. Pottering Round the Mae Hong Son Loop. 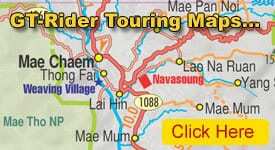 Mapping Towns on the Mae Hong Son Loop. Rak Thai the Chinese village on the Myanmar border. 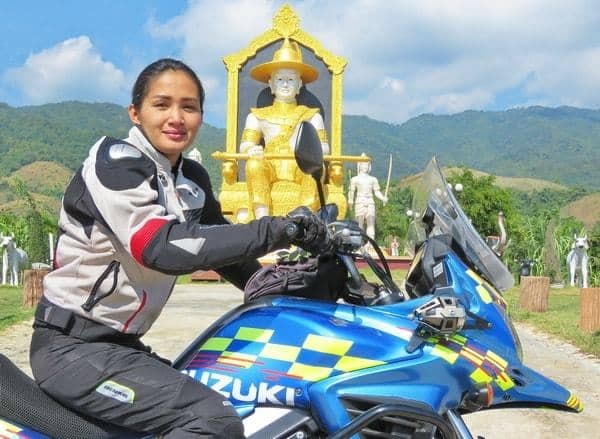 The GT Rider Chedi. 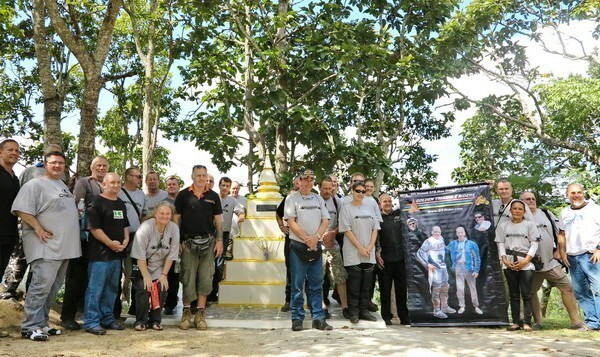 GT Rider has their own memorial chedi on Doi Kong Mou mountain overlooking Mae Hong Son city. 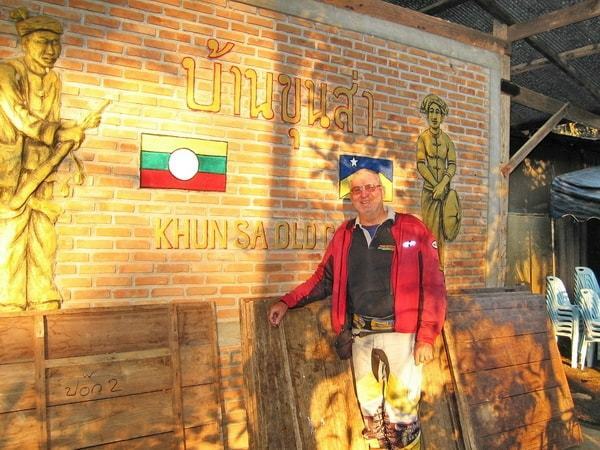 The chedi is in honour of departed riding mates who have lived in Thailand & ridden on the Mae Hong Son Loop. 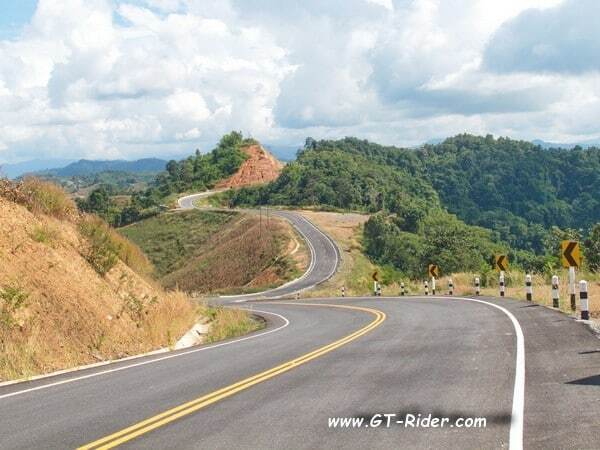 GTR has an annual ride to Mae Hong Son for which all riders are welcome to join and pay their respects. The event is usually the first or second weekend of November. Inauguration of the GTR chedi. 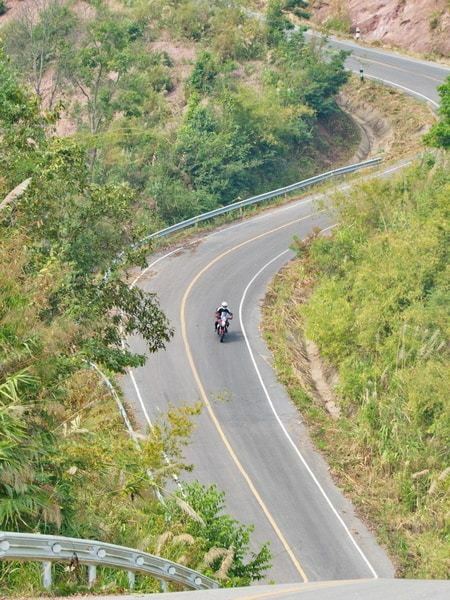 The Mae Hong Son loop has three spectacular steep roads to ride. Rak Thai the Chinese village on the Myanmar border, north of Mae Hong Son. You can spend a night here. Rak Thai is unique in North Thailand & can be the highlight of doing the Mae Hong Son Loop. The views over the lake at Rak Thai re sensational. South of Mae Hong Son are Meo Microwave & Nong Khiew . Use the Nong Khiew road to cut across to Mae Chaem, or even use it for a day trip from Mae Hong Son. Meo Microwave is a wild steep twisting road that dead ends in a Hmong village on a mountain. The views here are spectacular. 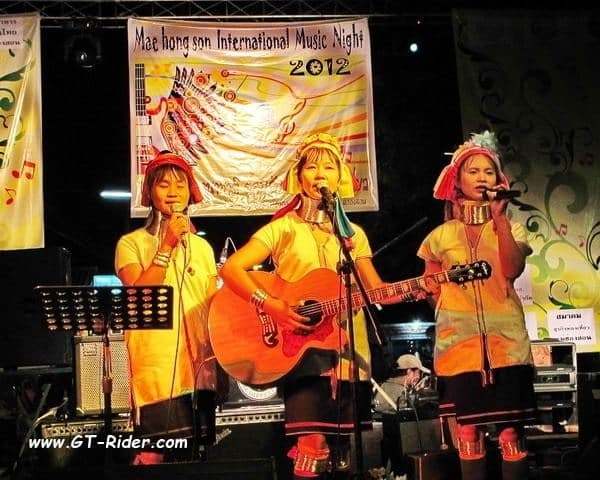 The Long Necks at the 1st Mae Hong Son International music night. Overnight in Mae Chaem / Mae Sarieng / Mae Hong Son / Soppong / Pai. Please yourself. Night life: Mae Chaem, Khun Yuam & Soppong have none. 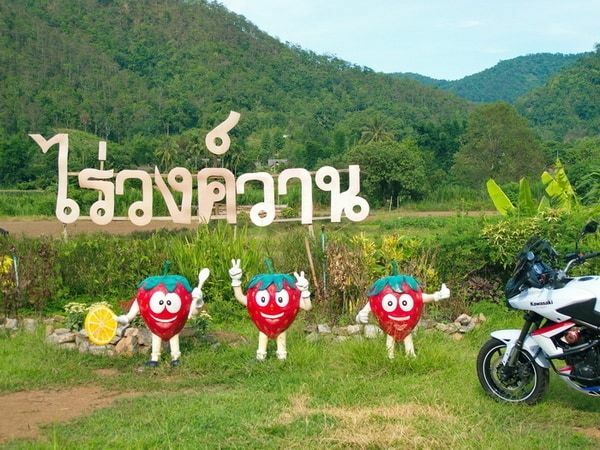 Pai has good night life; plus Mae Hong Son & Mae Sarieng both have enough to keep you entertained. 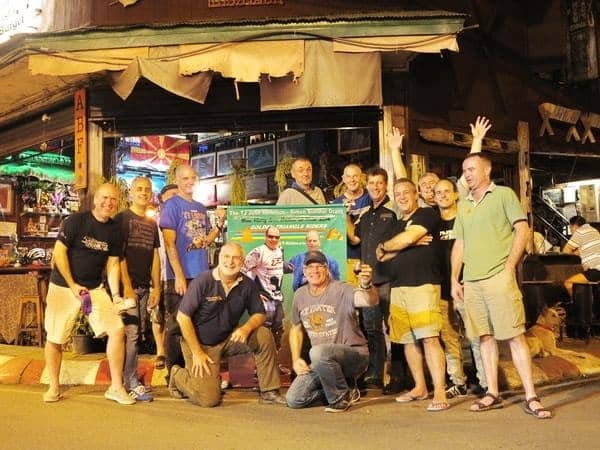 Crossroads Pub in Mae Hong Son. A GTR favourite. 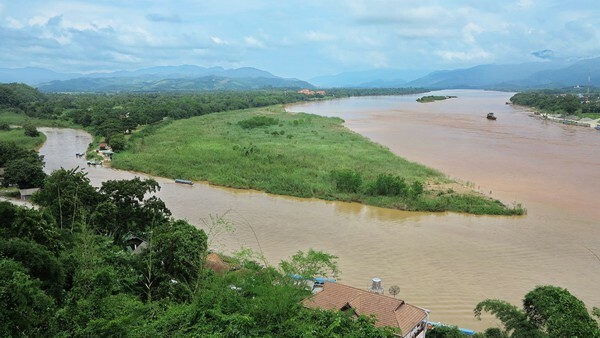 The Golden Triangle: The Mekong river, Thailand / Myanmar / Laos. 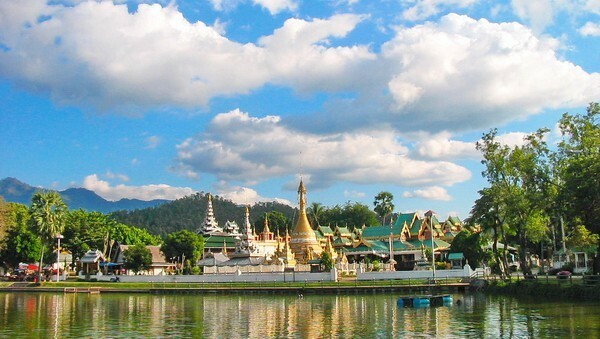 Chiang Mai – Chiang Dao – Arunothai – Fang – Tha Ton – Doi Mae Salong – Thoed Thai – Doi Tung – Mae Sai – GT – Chiang Saen – Chiang Khong – Pha Tang – Phu Chi Fah – Chiang Kham – Tha Wang Pa – Pua – Doi Phukha – Nan – Chiang Muan – Phayao – Mae Kachan – Chiang Mai. Or from Nan – Wiang Sa – Na Noi – Khun Satan – Phrae – Lampang – Chiang Mai. Or do these in reverse. Please yourself where you sleep, but you should never be more than 45 minutes away from cozy accommodation. Chiang Rai province: it should be noted that Chiang Rai province is jam packed with attractions, amazing roads & mountains to ride. 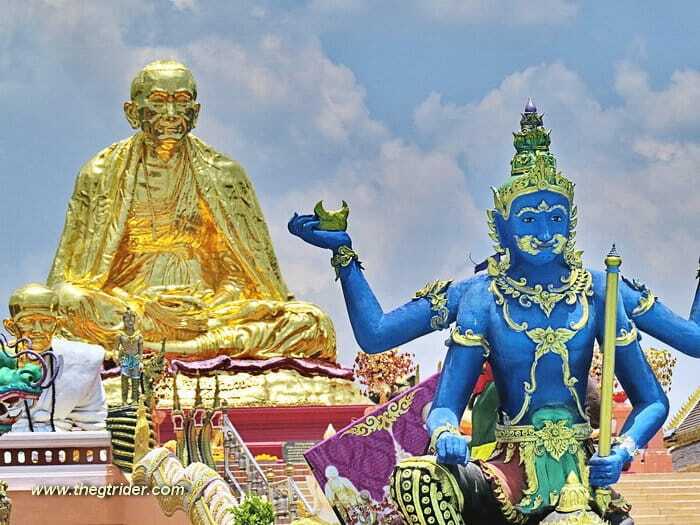 Chiang Rai province is # 1 for attractions! Take your time & don’t ride on through too quickly. To get the big picture, use a GT Rider Golden Triangle guide map. 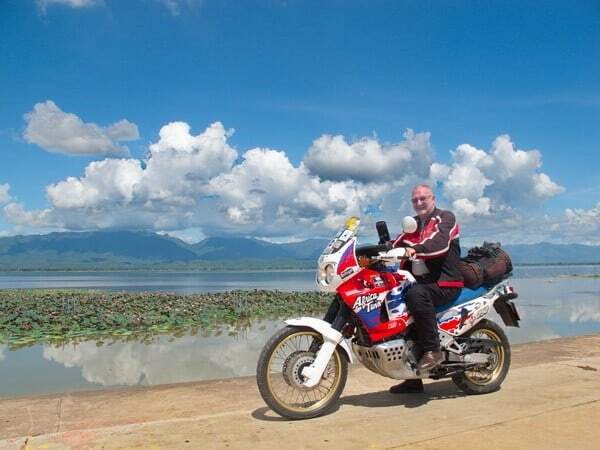 Mountain roads to ride on the GT – Laos border run. Phaya Phipak – the big dipper. The serene beauty of Phayao lake. Trip reports: Places to go & see on the Golden Triangle Loop. The Big Dipper the steepest road on the GT – Laos border run. 6 nights 7 days in the Top North. 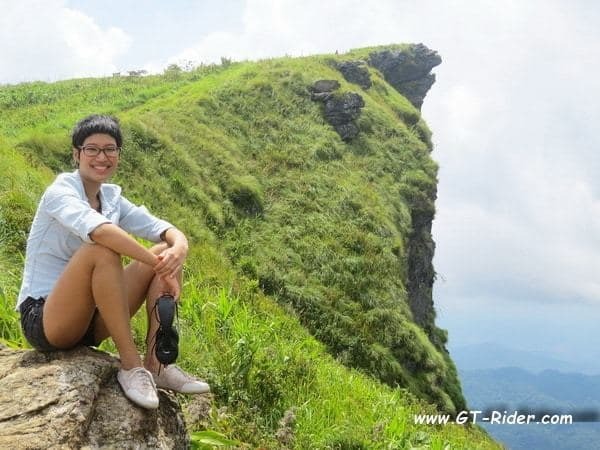 Spectacular Phu Chi Fah cliff top on the Thai – Lao border. Thoed Thai: You can’t claim to have done the Golden Triangle unless you have a night in Thoed Thai; the ex home of the late Khun Sa, the famous Shan freedom fighter / drug war lord. Khun Sa’s old camp – headquarters in Thoed Thai. 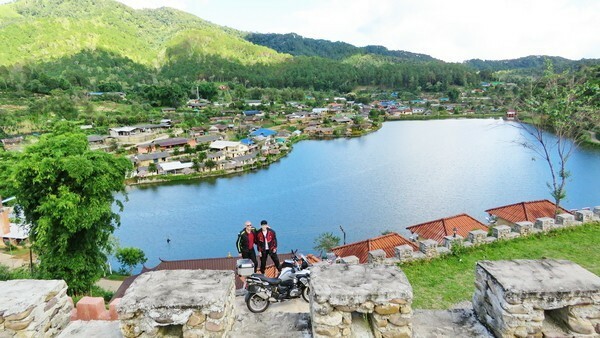 Nan province: Has the best riding in North Thailand & you could easily spend 3-4 nights in Nan riding amazing loops & roads. Nan has the best roads for motorcycle touring. Some waterfalls in the North. The top roads & rides in the North. Take your time. Soak up the culture & history, don’t just focus on the number of kms you can log up. 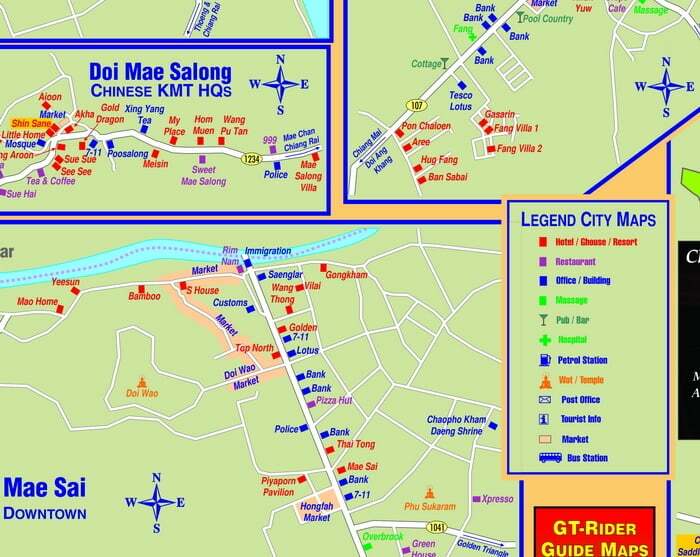 To fully understand the road network & how to get the best out of your trip take a GT Rider Golden Triangle guide map. With so many choices and options available it is important to know where you are in relation to all the towns and the distances involved. A GTR guide to North Thailand’s Hot Springs. Most of the North’s hot springs have private bathing houses, or bungalows to stay over night, to have a nice soak & soothe the body after a long ride. In the cold season these places are an absolute delight to spend time at. Sippa Hot Springs are a GTR favourite. The smaller towns generally give you a better cultural experience. 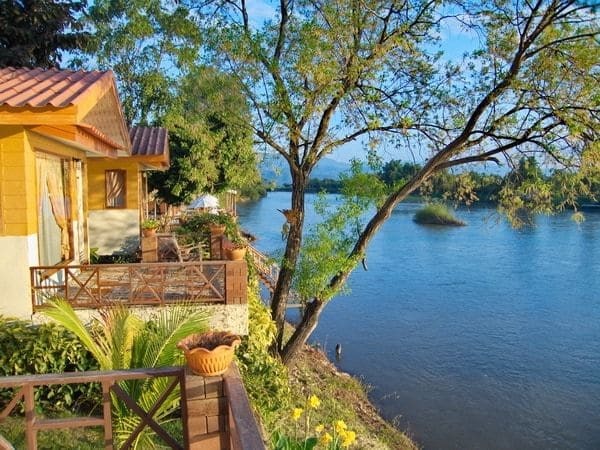 Tammila guesthouse in Chiang Khong is the GTR favourite. Food – where to eat: GTR has a list of recommended restaurants for every town. GT Rider city maps are the best, most accurate town maps with the most detail. If you looking for dirt rides: check out this GTR directory of dirt options. Day 2: Rest day Cnx? Day 5: Return to Bangkok. Day 5: Chiang Mai – Bangkok. Multiple choices & more than likely you will make up your mind on the day, subject to the weather conditions & outlook. Train – you can transport your bike by train. You are supposed to travel on the train with your bike. Post Office yes you can post a bike in Thailand from one post office to another. 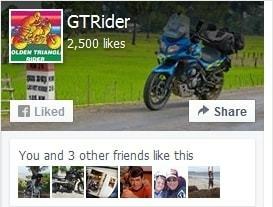 The GT-Rider.com Trip Report Forums have some detailed trip planning information for other S.E. Asian countries.